Preheat the oven to 425°. Melt 1 tablespoon of the butter in a skillet. Add the diced carrots, onion and celery and cook over moderate heat until softened. Stir in the herbs. 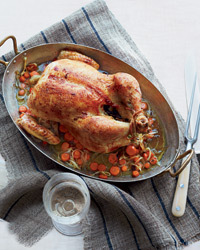 Wash the chicken rapidly inside and out with hot water and pat thoroughly dry. For easier carving, cut out and discard the wishbone. Pull the neck skin up over the breast and secure it to the back with a toothpick. Salt and pepper the cavity and spoon in the cooked vegetables, a handful of parsley stems and celery leaves and the lemon slices. Massage the chicken all over with 1 tablespoon of the butter, then truss it. Alternatively, tie the ends of the drumsticks together and tuck the wings under the body. At 15 minutes Brush the chicken with the remaining 1/2 tablespoon of butter. Scatter the sliced onion and carrot all around. Reduce the oven temperature to 350°. At 45 minutes Brush the lemon juice over the chicken. If necessary, add 1/2 cup of water to the vegetables to prevent burning. At 60 minutes Baste with the pan juices. Test for doneness: The drumsticks should move easily in their sockets; their flesh should feel somewhat soft. If not, continue roasting, basting and testing every 7 to 8 minutes, until an instant-read thermometer registers 165°. Spear the chicken through the shoulders; lift to drain; if the last of the juices run clear yellow, the chicken is done. Let rest on a carving board for 15 minutes; discard the string. Spoon all but 1 tablespoon of fat from the juices in the pan. Add the stock and boil until lightly syrupy, 5 minutes. Strain; you will have just enough to bathe each serving with a fragrant spoonful.